Now that I’m living in Matsue, I often find myself not having much to do. Which means I’m usually sitting at my computer or sitting on my bicycle. One of my first destinations was the sea, which is about 10 km north from where I live. 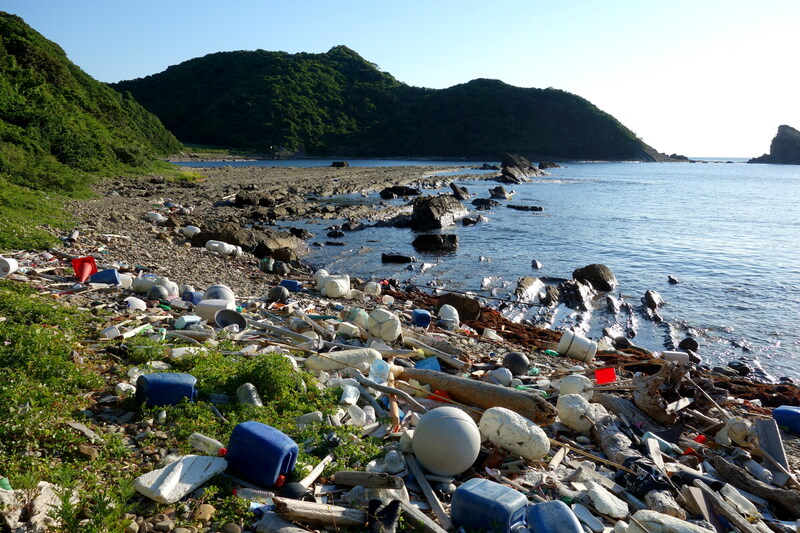 The spot marked “須々海海岸” on Google Maps is overwhelmingly beautiful and saddening at the same time. 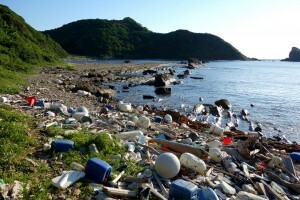 While the pictures shared on Google Maps may show you that this is indeed a very beautiful spot, most of these pictures do not show that there is a lot of plastic trash on the beach. So not having much to do, being somewhat young (28 back then) and being reasonably environmentally minded, I one day decided to see if I could maybe help clean this place up. 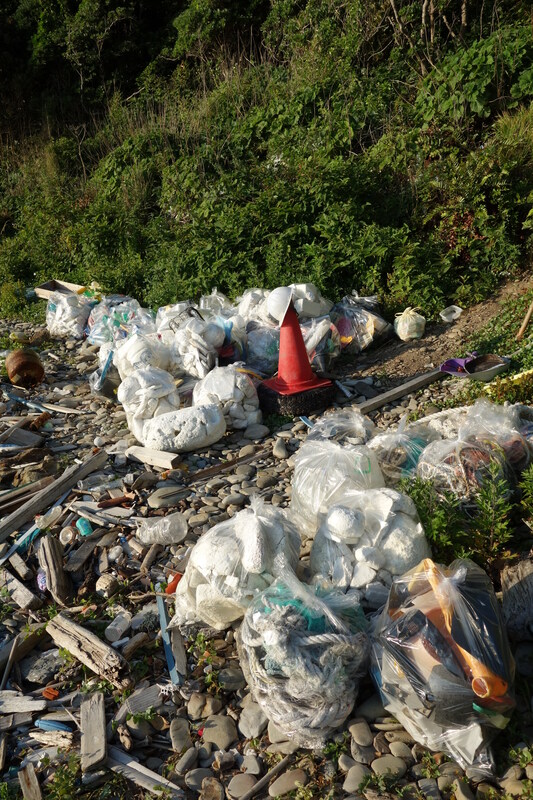 Unfortunately, my Google queries for beach cleanup activities in Matsue didn’t yield any results, so I just decided to buy a pair of (gardening) gloves and a pack of large trash bags and get some cleaning done. It turned out to be a great way to pass the time (in late spring, when it isn’t crazy hot and mostly not raining), so I kept coming back, and decided to continue until the tsuyu (rainy season) would kick in. Just gathering the trash is of course not quite enough. You need to get it to the waste processing facilities. So I just went to the town hall and asked the person at the entrance what to do. 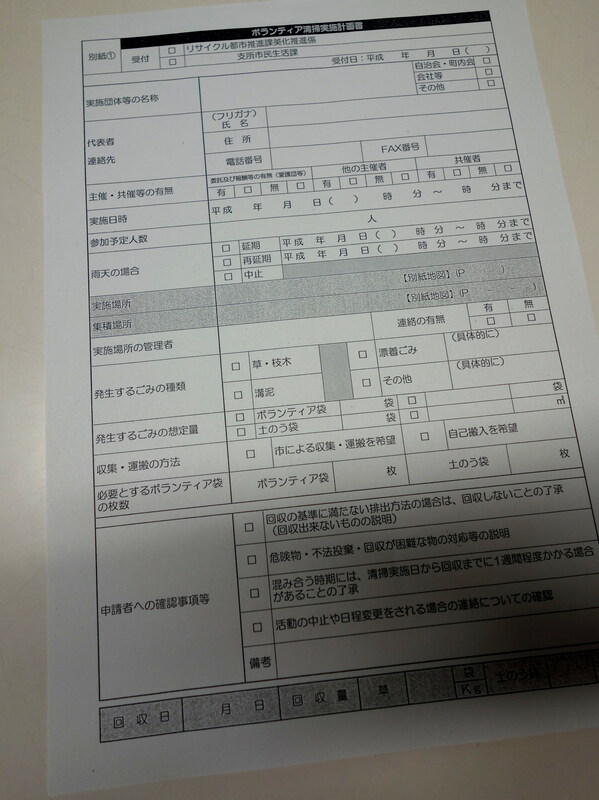 I was told to go to the “volunteer” department at the 松江市環境センター (Matsue Environmental Office), where I had to fill out a form (pictured) with the following information: personal information, pick-up address (no house means no address, so this is a bit hard, but the guy at the counter really knew his way around town, and showing him the place on Google StreetView helped a bit too), the number of trash bags, cleanup date, next date in case rains gets in the way. After filling out the form, I got the number of Matsue-branded trash bags that I’d put on the form, at which point I had to explain that I’d actually already started cleaning, unfortunately using regular unlabeled trash bags. That was fine, but he told me to use the right bags next time. 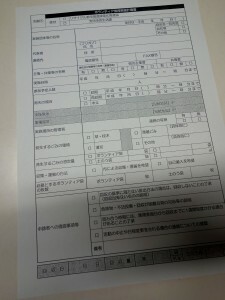 The form allows you to tick 自己搬入 (bringing in the trash yourself), but you’d probably have to explain yourself if you want to do that. I opted to have a truck pick up the trash I’d pile up at the side of the road, which usually takes place within one week after your cleanup date. Not knowing much about the recycling facilities here, I generally sorted the trash by type: plastic bottles (of which there are many, many), plastic bottle labels, plastic bottle caps, styrofoam, hard plastic (probably mostly originating from buoys), soft plastic (think polyester), random other plastic. I had no intention of taking care of tree branches/logs, and was in fact told not to pick those up, as they wouldn’t fit into the plastic bags anyway. This place doesn’t have a lot of people come by, but the people I did meet were quite eager to talk. Mostly older guys who have come out to do some fishing. I’ll probably re-commence my cleaning activities when it gets a bit cooler, perhaps in September. Hoping the place won’t be infested by spiders. If you’re finding yourself longing for some western dish that is generally not available in Japanese restaurants, perhaps something your mom made when you were child, your only option may be to cook the dish yourself. Maybe this article will help you find the necessary ingredients? If you don’t find your answer here, feel free to leave a comment. This is a very popular stock for western foods: Ajinomoto Consomme. According to the ingredients it includes both chicken and beef extracts. There are other stocks available, including chicken, beef, and vegetable stocks, but not all supermarkets have all of these. Beef stock feels a bit less common, and vegetable stock almost rare. Ketchup, mayonnaise and mustard are available, but Japanese mayonnaise is made differently and tastes a bit different. You can get western-style mayonnaise at import shops like 成城石井 (Seijou-Ishii). There are three types of mustard that are widely available in Japan: Japanese mustard (からし, karashi), French Dijon mustard, American yellow mustard. Karashi is similar to wasabi or horseradish in pungency. Ketchup appears to be about the same as everywhere else. As for vinegar, you will find at least wine vinegar (red and white) and balsamic vinegar. I’ve never seen malt vinegar in shops, but it appears to be available on Amazon. Onions, scallions, leek, garlic, green peppers, and carrots are all widely available. Celery stalks and leaves are often available, but I’ve never seen celery root. Shallots are rare. If you’re into pumpkins/squashes, Japan has kabocha: green outside, orange inside, both parts being edible. That’s the only type of squash that I’ve seen, but very widely available. Everything else may be difficult to find. The Gyoumu Supermarket generally shines in the canned goods category. Canned/glass-jarred olives are often available at supermarkets. You can get them cheapest at the Gyoumu Supermarket. The Gyoumu Supermarket shines here, too. Most supermarkets with a non-tiny vegetable section will have parsley. If it’s a bigger supermarket, they will probably have other fresh herbs. Basil is the most common. You’ll often find rosemary and sage. Everything else may be difficult to find, but have a look at SB’s lineup of fresh herbs. Most herbs and spices that I’m familiar with are mostly available. Most stores sell herbs and spices in tiny bottles containing 3-10 g of actual product. In the case of paprika, you’re likely to use up the entire bottle for a single meal. If you regularly use a certain herb or spice a lot, you may be better off buying in bulk from Amazon. For curry mixes, you usually have two choices: Garam Masala and a typical mix that produces the flavor of Japanese curry. You can get minced meat of all of the above. Occasionally, you’ll find a supermarket that doesn’t have minced beef. 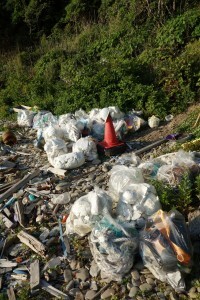 (This seems to be a more common occurrence in Shimane.) The most common type of minced meat is a mix between beef and pork. Most supermarkets will also sell steaks, but you’ll probably pay 1000 JPY or more for a decent-sized one. Wiener sausages are available at virtually all supermarkets. Most supermarkets will have a small selection of non-wiener sausages. If you want to eat decent sausages, I recommend the こだわり生フランク (kodawari nama-furanku) from the Gyoumu Supermarket. I think these are probably among the best sausages you can buy in Japan. Other types of meat may be hard to find, but some supermarkets have mutton now. Lots of fish in Japan. 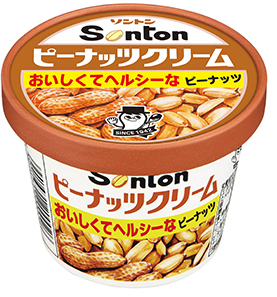 All nuts that I’m familiar with, except hazelnuts, are available at most supermarkets, though (unless they’re peanuts) usually quite expensive. Most supermarkets have only two types of flour: 薄力粉 (hakurikiko) and 強力粉 (kyourikiko). Hakurikiko is cheaper, and is usually used for cakes, cookies, okonomiyaki, and tenpura. Kyourikiko is used for bread. Both are non-whole-wheat. To get whole-wheat, rye, and other types of flour, go to Seijou-Ishii or similar import stores. Anderson http://www.andersen.co.jp/ is quite okay. Linde (http://www.lindtraud.com/) in Tokyo has pretty good bread. High-quality supermarkets like Seijou-Ishii usually have decent bread too. By the way, this raisin and walnut stone oven bread tastes very nice and is possibly available at many Aeon stores. So what to put on your bread? Japan doesn’t have a large selection of spreads, but peanut butter, nutella, (at least) strawberry jam, cheese (see above), and some types of meat are available at most supermarkets. In supermarkets, you’ll often see small Real salami is pretty expensive. Seijou-Ishii and the Gyoumu Supermarket usually sell bruschetta spreads. About 2.5 months ago, I moved away from Tokyo (Kawasaki actually). I now live in Matsue, Shimane prefecture. Matsue is the prefecture capital of Shimane, and is known for being the city that Matsumoto Yukihiro (the creator of the Ruby programming language) lives in, and for the sunset on Lake Shinjiko (宍道湖). Update 2017-05-11: Matsumoto Yukihiro published an article on Medium (Japanese) shortly after I posted this one explaining his reasons for moving here. Back in Kawasaki, I lived in a shared house. Now, I live in a Leopalace apartment. Leopalace apartments are (usually?) furnished and almost ready to live in. There’s an AC, a fridge, microwave, small desk, various closets (I like the one under my bed, real room saver). You will still need a futon, kitchenware, clothes, towels, toilet paper. In Kawasaki, my rent was about 63,000 JPY per month. Now it’s around 53,000 JPY, and I have a lot more space, plus my own kitchen and bathroom. (I also have to pay for electricity, water, and gas however.) Leopalace in Matsue has much cheaper places too, but I prefer newer buildings with heat insulation and soundproofing. (Also, if you do not necessarily need a furnished apartment, you can find much cheaper places.) My building is from 2002, and seems to have pretty decent insulation. (I haven’t had to use my air conditioner in over a month.) You may have heard that Leopalace buildings have poor soundproofing, but that’s not really the case for my apartment at least. I can sort of hear my upstairs neighbor’s washing machine and (sometimes) phone vibrations, but no music or talking. There’s a small problem with these companies: they’re mostly headquartered in Tokyo, so it’ll often feel like working remotely and you’ll probably be talking to people you’ve (almost) never met before, every day. Remember: communication can be pretty tough at the office, even when nobody’s working remotely. Having remote workers makes communication even more challenging. As with all things in life: don’t expect anyone to be an expert at handling remote workers, even if they seem like they should have a lot of experience. I really like climbing mountains and riding bikes, and Matsue is pretty good for that. There’s a train line (Ichibata Line) here that allows you to bring your bicycle on the train without taking it apart and packing it in a bag, like you have to do at other train lines. Let me just quickly go off on a tangent: if you need a cheap bicycle that performs pretty well, I recommend giving ドンキホーテ (Don Quijote) a… shot. (Originally no pun intended.) Mine weighs about 12 kg and I bought it at Don Quijote for about 35,000 JPY. (Also the most expensive (non-electric) bicycle they had on offer.) Perhaps you don’t get super-high-quality components, but nothing too shabby, either. I had to replace my brake pads a bit sooner than expected, and my rear tire after about two years (which may be a bit out of the ordinary), but everything else is holding up pretty well. Note: I weigh about 65 kg, so your mileage (originally no pun intended) may vary. Some friends at the shared house helped me pack the Clavinova. Separating the actual piano from the stand wasn’t that hard actually. Packing involved building two huge boxes out of smaller boxes to fit in the piano and the stand, and putting in a lot of cushioning. (We put my futon in there, and several blankets.) Don’t let anything poke out, such as the pedals, the feet, or the headphone holder. Take everything off and put these things in a separate bag. Putting the thing back together alone is pretty tough, so I contacted a local 便利屋 (benriya), and had a guy come over for a bit more than an hour for about 4,000 JPY. These things don’t have fixed prices, so if you like negotiating you can probably get a better deal. Make sure you put your screws in separate (labeled) plastic bags! Put effort into remembering how you disassembled everything.